Phil Martin ran in the Berlin Marathon. Athletes from Nene Valley Harriers and Peterborough AC hit the tarmac at the South of England Road Relays on Sunday. Nene Valley had high hopes for their Over 50 quartet after taking third place at the same event last year. Twelve months ago though the competition was staged on a Bedfordshire airfield. On Sunday it was held at the iconic Crystal Palace Park and that attracted much stronger entries than last year. And the stiffer opposition meant that Nene Valley finished outsice the medals in eighth place. Dave Neal, who used to race regularly on the Crystal Palace track as a youngster when trained by English long-distance legend Gordon Pirie, ran a scorching opening leg for Harriers, clocking 17.03 on the twisty and testing 5km circuit. And that turned out to be the fastest leg of the day among the 64 athletes competing in the Over 50 race. Sean Beard also put in a good run for Nene Valley on the anchor leg. Peterborough AC had the best result of the day with their Over 40 team finishing sixth. The Peterborough AC senior men came in 32rd with Steve Robinson leading the way with a 16.12 clocking. Their senior ladies team finished in 44th place. Three of the region’s top marathon men experienced mixed fortunes in the Berlin Marathon at the weekend. 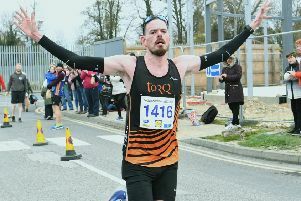 Peterborough AC’s Phil Martin was the first local home in 306th place, with a time of 2:39.19. Martin has run eight minutes faster previously and was disappointed with his effort. Stamford Striders pair James Skinner and 51 year-old Jim Morris both had pleasing runs. Skinner crossed the line 507th with a 2:45.08 clocking while Morris’ time of 2:48.59 earned him 686th place.